"E.E Spencer & Son / Wood & Co provide us with a professional delivery service throughout the UK to a consistently high standard. The quality of their vehicles, drivers and staff portray a professional image to our customers. We operate in a sector where we have to react to changes in customer requirements at very short notice. E.E Spencer & Son / Wood & Co with their personal service are able to respond positively to these schedule changes. We are pleased to have been associated with Spencers for over 20 years during which time their levels of service have been excellent, and are delighted to recommend them." 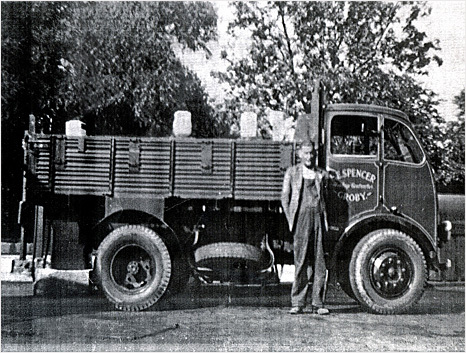 Eric Spencer started his haulage company in 1930 with his brother Wilf delivering coal from Whitwick pit with a Model T Ford. Later replacing the Model T with a series of REO Speedwagons, working mainly for Groby Granite, he acquired the Seddon pictured in 1949. Continuing to deliver Aggregates and bricks for the likes of Groby Granite, Bardon Quarry and Hanson Brickworks, Eric's son Richard and daughter-in-law Audrey then took over the running of the business in the mid 1960's until the 1980's when his children Julie and Michael also became involved. During this time Richard acquired the Leicester based Coal Merchants Wood & Co (Leicester) Ltd, a company Richard did much work for in the 50's and 60's. Whilst mainly still continuing work in our core area of aggregates we have since the 2000's successfully expanded into growing market areas such as the transportation of recycled materials.